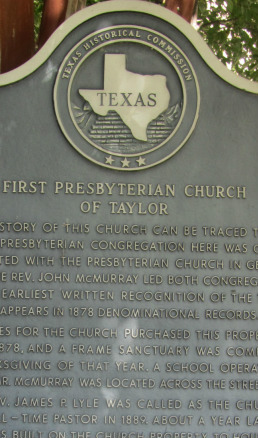 We began as a congregation in 1876 and purchased our property here on 6th Street in March of 1878. By Thanksgiving, the sanctuary was completed, and the Rev. John McMurray led both the congregtion and operated a school across the street. In 1894, a Cumberland Presbyterian Church was founded in town, and the two congregations merged about 1910, retaining the First Presbyterian name. Because the church grew so rapidly, we needed a larger facility, so a new brick sanctuary was built on the site in 1912-1913. Since then we have thankfully and faithfully served our Lord Jesus Christ in this community, establishing deep roots of faith.